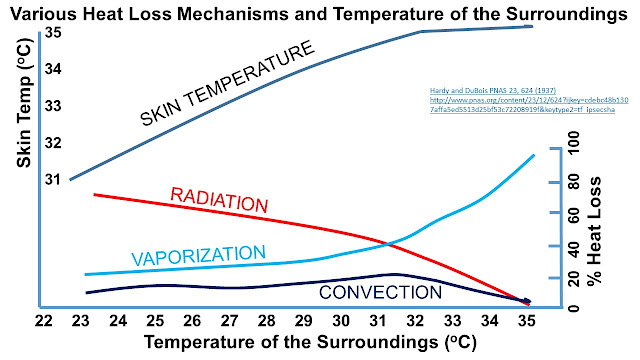 Humans are warm blooded with optimum skin temperature at about 35C. A person also produces about 100 Watt of power through metabolic activity (click here for an estimate) that must be discarded to the surroundings - via radiation, vaporization and convection. Relative importance of a loss process is determined by the difference in the temperature of the body and the surrounding air (more on this later). In winter, when the surrounding temperatures are low, we lose more energy than we produce and feel cold - wearing several layers of clothing traps extra air and reduces energy loss by convection. Wool is very effective. Central heating (CH) is set to maintain temperature inside the building at a comfortable 22C. In summer, the surrounding temperatures can be much higher. The body does not lose heat efficiently and air conditioning (AC) is optimally set at about 26C. To increase heat loss by convection and vaporization, the best strategy would be not to wear any clothes - going naked is not always possible - and one resorts to wearing cotton clothes to keep cool. Cotton is also permeable to water vapour and allows efficient vaporization to occur. Both CH and AC are energy intensive and form the biggest slice of a family's energy bill. They also have serious impact on climate change through the emission of greenhouse gases (GHG). We are advised to reduce CH to 18-20C range and use less AC to help save the planet. Wear more layers and chunky woolens to keep warm in the winter. I had estimated that sensible conservation measures could save £2 billion per year in residential energy costs in the UK alone. Energy conservation is a must for our societies and I think everybody should play their part in reducing energy consumption. The research work at Stanford by Professor Yi Cui and colleagues about personal thermal management (PTM) has the aim of managing heat loss from individuals obviating the need to maintain the temperature of the surrounding space at levels currently used. PTM is achieved by a clever design of the clothing material using nano-technology (NT). Before I explain how this is done - let us look at the way the outer surface of the human body gets rid of the 100W of internally generated heat. I have redrawn the following slide from Hardy and DuBois and it shows the relative importance of the three mechanisms of heat loss from the human body. Inside buildings the temperatures are generally less than 30C and radiation is the most important mechanism of heat loss. 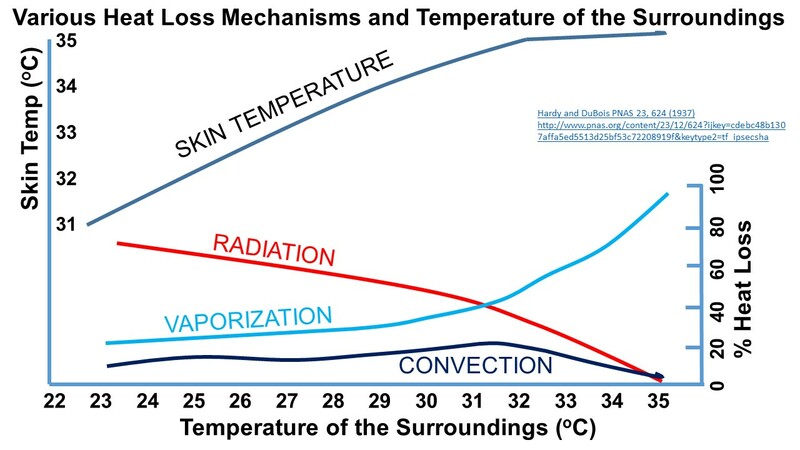 Vaporization is essentially sweating and becomes overwhelmingly important when temperatures reach above 33C - at this point radiation and convection are essentially switched off as they depend on the temperature difference between the skin and the surroundings. For the interesting temperature range of 20 to 26C, radiation is the most important mechanism and I shall explain this process in more detail. 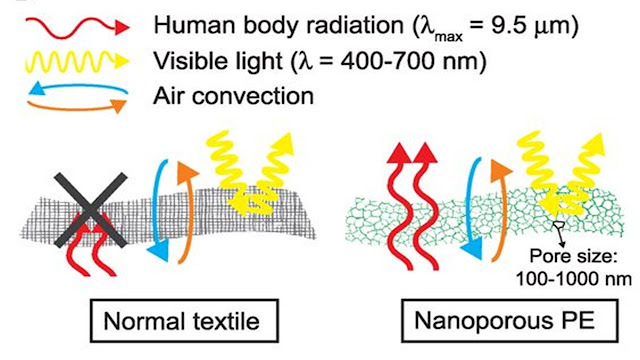 The Stanford group's hi-tech fabric also focuses on radiation losses for PTM. If we look at the blackbody radiation closely - we find that it is composed of a range of wavelengths. The range depends on the temperature T(in Kelvins) of the emitting surface; the intensity of radiation is a maximum at a wavelength (in microns) given by 2898/T(in K) - this is called the Wien's Law. Humans at 35C or 308K emit radiation centered around 9.4 microns or 9400 nm covering a range from 7 to 14 microns. This is in the infra-red (IR) region of the spectrum (see slide below). 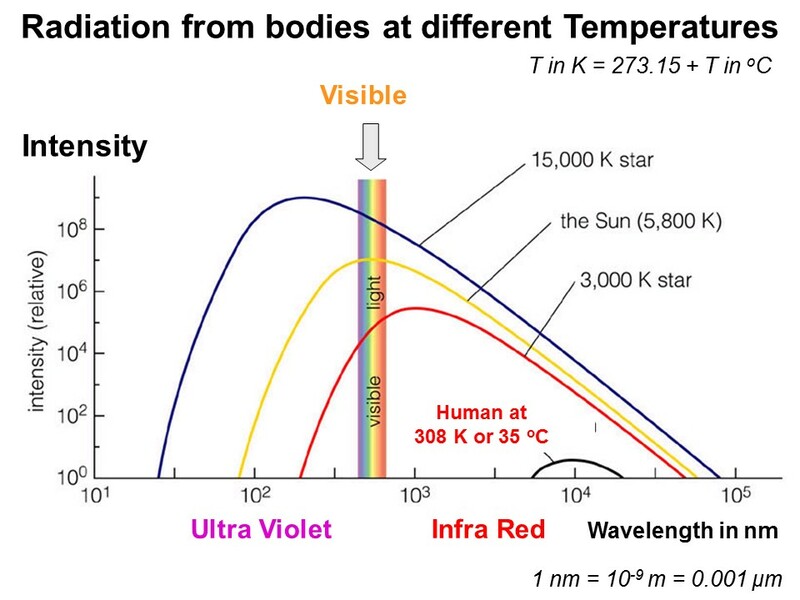 The figure also shows blackbody radiation curves for some stars - in fact it is from these types of measurements that we infer the surface temperature of a star. Our Sun has a surface temperature of about 5800K and the peak of emission is in the visible region (2898/5800 = 0.5 micron or 500 nm) with significant radiation in the ultraviolet and infrared (IR) parts of the spectrum. PTM on a cold day: NanoPE looks great on a hot day as it allows us to lose heat efficiently. What about winters when we wish to retain as much of the body heat as possible? 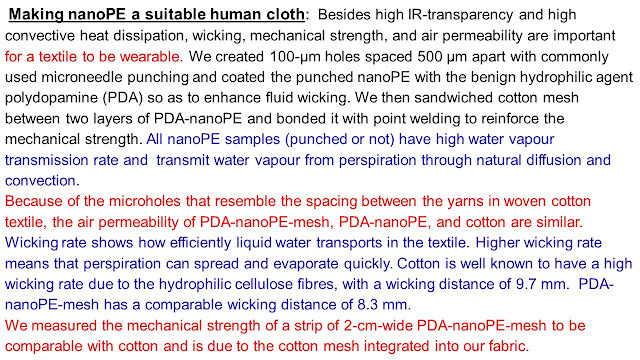 For this, we just need to switch to silver nano-wire (AgNW) embedded fabrics. (See slide below). The metallic nano-wires form a conductive network that is highly insulating because it reflects human IR radiation. The breathability and durability of the original cloth is not affected because of the nano-wires' porous structure. Moreover, nano-wires are conductive and additional heating may be provided by using a battery (Joule heating). Let me explain further: In winter, the wall temperatures even in a properly heated house can be as low as 20C. This increases heat loss by radiation - heat loss increases rapidly as temperature difference between human body and the walls gets larger. Using AgNW fabric, one can keep the room temperature significantly lower - say 16C and still not feel cold. Currently, 42% of energy used is spent on residential temperature management. AgNW fabric works because of the low emissivity (equal to 0.02) of silver and it reflects back over 90% of the IR radiation from the body to be compared to 20% reflected by normal clothing (emissivity equal to 0.8). The spacing between nano-wires is on average 300 nm (1 micron = 1000 nm) while the human radiation has a wavelength of 9.4 micron or 9400 nm. The radiation essentially interacts with the silver nano-wire mesh and is reflected as from a continuous silver film. The 300 nm wire spacing is large compared to the size of a water molecule (0.2 nm) and AgNW shows good breathability. Is AgNW expensive? - Not really. A coating of silver nano-wires uses very little silver - about 0.1g per square meter. The Standford team also found that repeated wash cycles do not affect the durability of the fabric. 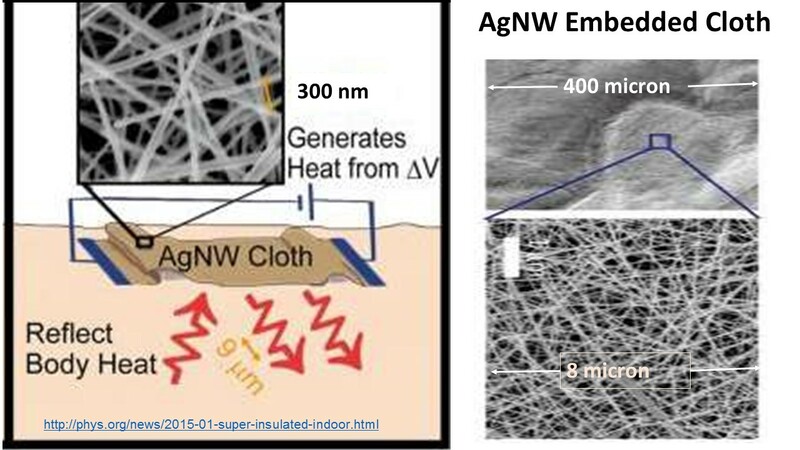 While the AgNW fabric is effective for personal wear, it does not replace the central heating systems as the authors might have argued in their report. A building must be heated to provide protection to water pipes, furniture and many other household items. Even for personal use, it is not possible to completely cover yourself with clothing and a reasonable ambient temperature of 16 to 18C is desirable. This is still effective in reducing energy requirements for space heating. Where this type of clothing may be most useful is for personal wear outdoors when one can cast away heavier bulky clothes in preference to AgNW wear. Both nanoPE and AgNW have been demonstrated to work in the laboratory. One hopes that they will work equally well in general use. This remains to be seen. Final Word: The work on PTM by the Stanford group is a good example of the way new technologies are impacting our day to day lives. 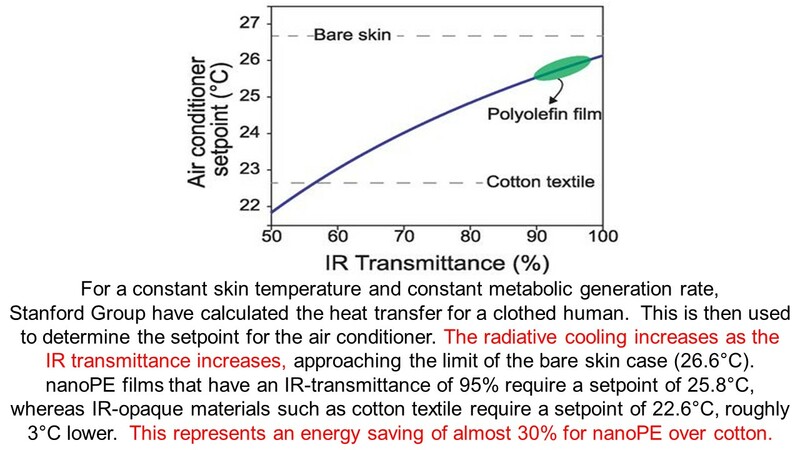 Historically, humans have used clothes made from available materials without serious understanding of how they help in maintaining body temperature during different seasons - cotton was better in summer and wool in winter. I have tried to demonstrate in this blog how science has provided a proper understanding of mechanisms by which body manages heat loss and in the way new technologies use this understanding to develop fabric and procedures that make the clothes we might be wearing in future just a little less bulky and more comfortable. The energy savings could be significant and will contribute to a reduction of the environmental damage that humans have unwittingly been guilty of. Every little help is to be welcomed in this endeavour. I would like to acknowledge with thanks comments by Professor Yi Cui, Stanford University on this blog.